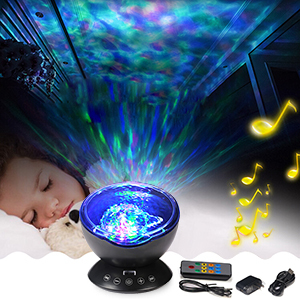 [Upgrade Version Ocean Wave Nightlight]: 12 LED Beads Music Light with remote controller and touch senor keys,freely turn on/off the lamp, change lighting mode, adjust the volume, to set automatically turn off timer. 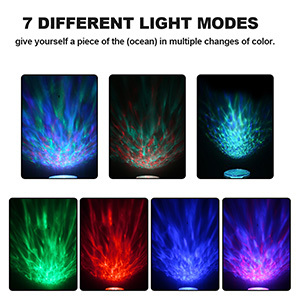 [45 degree Adjustable & 7 Light Projection Modes]: Project the light straight up or point in a different direction in 7 color lighting modes, choose which mode show depending on your mood , bring the seaside home to you! [Auto Off Times]: 3 Auto off timer options- built-in 1H, 2H, 4H auto off timer, the aurora projection light will automatically shut off after the preset time. And of course timer can be canceled to stay on all night long. 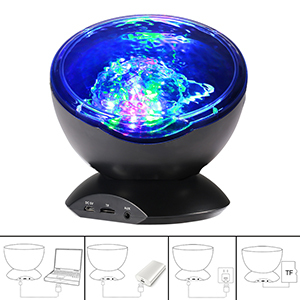 [Multiple Choices]: Matched with USB Cable and Wall Adapter, and controlled by both touch sensor key and controller (2*AAA battery not included) to project colorful light for creating Romantic,Relaxation,Cozy Atmosphere, which greatly be used for bathrooms, living rooms, baby rooms, parties or any other. Have no time for a seaside trip? 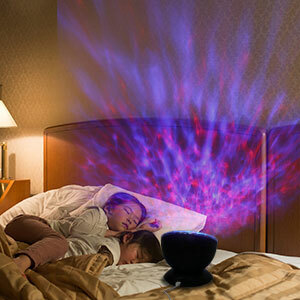 Now you can see it at home or in your office simply by turning the ocean wave night light on. And the mini speaker let you enjoy the tranquility after a day's work. About How to Adjust the Angle? ● Please push the projection panel downward to change the angle, please notice that , it can be adjusted 45°. 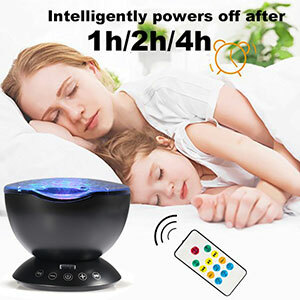 ◆ Built-in 1H, 2H, 4H auto off timer, freely to set shut off automatically after the present time by Remote Controller. And of course timer can be cancelled to stay on all night long. ◆1, Long press the switch key 3 seconds to turn on the light mode 1 light, while lullaby music 1 play. ◆2, Short press the switch key to replace the light mode. ◆3, If you only need to replace the hypnotic song, press the remote control or host to replace the Previous or Next song. ◆4, When inserting the TF card or external source, the lullaby automatically shut down. ◆5, When inserting the external sources, the host and remote control Previous or Next song can not been operated. ◆6, According to the remote control H1 / H2 / H4 that the host timer settings, in 1 hour / 2 hours / 4 hours after the automatic shutdown. ◆7, Press the remote control TIMER OFF button to cancel the timer function. ◆8, Long press the key to turn off.
. Compare with other similar ocean wave projector on the market, our new version matched with Wall Adaptor and USB Cable to charge it with power bank,mobile devices or AC plug,easy to operate it! ✔. 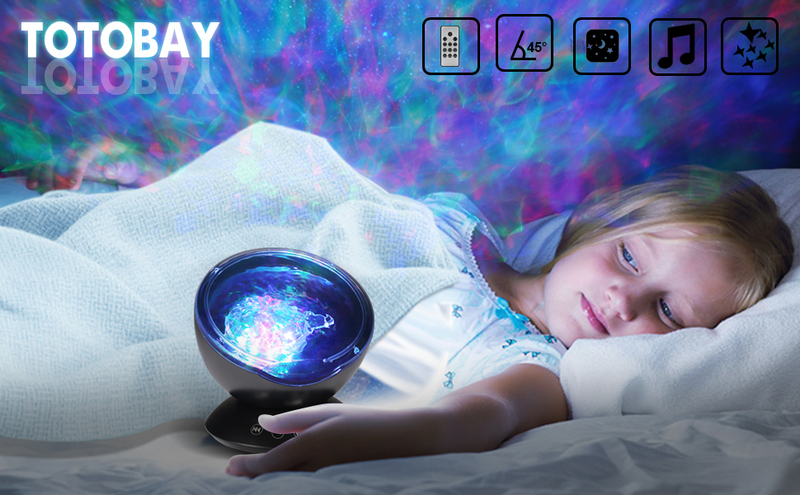 Support to Plug Mobile Devices or Insert a TF card (not included) to enjoy lullaby music, relaxing, meditation music.